Left to right: TRX CEO Carole Teolis, TRX COO Karina Drees, and Jeff David of TSWG. Photo courtesy Simon Schneider, Global Security Challenge. 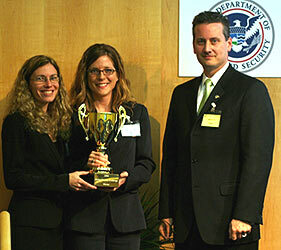 TRX Systems, a company headed by ISR alumnae Carole Teolis (ECE Ph.D. 1994), has won first place as "Most Promising Security Start-up 2008" in the third annual Global Security Challenge (GSC) competition. At the international finals held in London on Nov. 13, CEO Teolis and COO Karina Drees presented the TRX product, SentinelTM. TRX beat out five other semi-final winners from the American, Asian and European regionals. The prototype of SentinelTM can effectively track individuals inside multi-story buildings with no special instrumentation or preparation of the incident site. The system provides accurate, reliable locations in 3-dimensions, indoors and outside regardless of the local environment, weather conditions, or availability of a Global Positioning System (GPS). TRX's innovative map generation software is a key part of the company's intellectual property. The software enables first responders to generate a floor plan if one is not available when they arrive on scene. These floor plans can greatly improve situational awareness as well as improve tracking capability. The system's precision location and health information for deployed personnel also could lead to a dramatic decrease in rescue time for distressed or downed firefighters. "Interaction with firefighters from the start has been critical to us developing a system that they will use and that meets their requirements," said Teolis. "The involvement of the Maryland Fire and Rescue Institute has been vital." As a graduate student, Teolis was advised by Professor John Baras (ECE/ISR). Teolis also holds a B.S. and M.S. in electrical engineering from Maryland. As the first-place winner, TRX receives a $500,000 federal contract from the Technical Support Working Group (TSWG), the U.S. national forum that identifies, prioritizes, and coordinates interagency and international research and development requirements for combating terrorism. "The Global Security Challenge is so important because it reaches new, small, non-traditional players that so frequently drive innovations," said Jeff David, deputy director of TSWG. "We are proud to sponsor the award because it is an effective launching pad for security entrepreneurs." TRX was founded by University of Maryland Professor Gil Blankenship, currently the associate chair of the Electrical and Computer Engineering Department. The company start-up began in the Technology Advancement Program, part of the Maryland Technology Enterprise Institute, the university's tech company incubator. It also was assisted by the university's Maryland Fire and Rescue Institute. Earlier this year, the company was named the Maryland Incubator Company of the Year for Homeland Security. TRX employs 17 people-seven full-time, seven part-time, and three consultants. All but three are University of Maryland alumni. TRX's research and development also has drawn support from the National Science Foundation, TSWG, the Department of Homeland Security, the Laboratory for Physical Sciences, the Center for Fire Safety Research and Development (CFSRD) and private investors. The State of Maryland has also supported TRX Systems through the Maryland Technology Development Corporation (TEDCO), the Maryland Industrial Partnership (MIPS) Program, and the Department of Business and Economic Development (DBED) Program.